Writing reviews of Mac antivirus software can be a thankless task, much like correcting e-mail grammar: no one particularly wants to hear about it, but there might be some value in the exercise. There have been no major viruses or malware outbreaks for Mac OS X since its introduction in March 2001 (kind of amazing, actually). That excellent track record doesn't make a strong case for running antivirus software on your Mac. Most antivirus software makers get around this by having their products do more than just look for Mac-specific threats. They will scan and clean your Mac of any Windows viruses that might come along so you don’t unknowingly pass them along to your Windows-using friends, making you a better Internet citizen. Some also protect you from phishing Web sites, giving some added value and protection. All of this can be checked off in the Good column. iAntiVirus 1.0 from PC Tools takes a different approach: its threat database only contains signatures for known Mac-specific malware (including viruses, worms, trojans, and the like), though the scanning engine is capable of scanning for PC threats as well. PC Tools made this choice so the app would be lightweight; its database is small, and it can scan many files very quickly. iAntiVirus took a little over an hour to scan both drives in my Mac Pro, which hold about 830GB of data. iAntiVirus offers three flavors of scans: Quick, Normal, and Custom. Quick scan is, not surprisingly, the fastest of the three, but it scans only certain areas of your Mac's hard drive (those that are known to typically harbor malware). The Normal scan takes longer but is far more comprehensive. If you have a particular set of folders that you want to examine, then a Custom scan is what you want. Archive files (zip files, for example) can be optionally scanned for viruses as well. 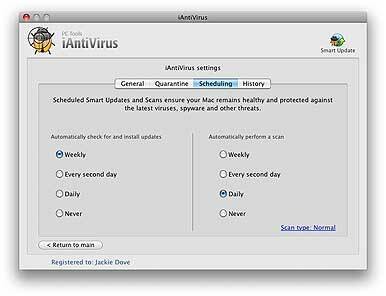 You can also schedule iAntiVirus to scan your Mac once a week, daily, every other day, or never. (Installation of updates for both virus definitions and the app itself can be scheduled as well, with the same options.) These scheduling options are basic at best. Ideally, you should be able to define the day on which weekly scans are done and create entirely custom schedules--scanning on the second Wednesday of the month, say. However, most users should be fine with the limited built-in scheduling. Complementing the three kinds of scans is IntelliGuard Real-Time Protection, which constantly runs in the background, protecting your Mac from nefarious files. When IntelliGuard (or any other scan) finds a suspicious file, a Growl-like alert window pops up in the upper right hand corner of your Mac's screen, letting you know what iAntiVirus has found and what steps it has taken. The iAntiVirus interface is very clean and easy to use. 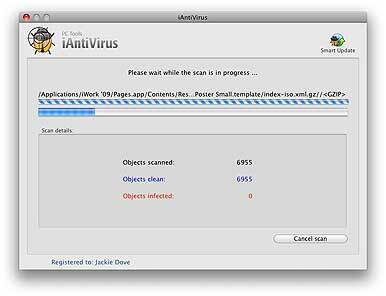 Some antivirus programs try to clean infected files and leave them where they are, but iAntiVirus places any files it suspects of being malignant into Quarantine. From the Quarantine, you can choose to either delete the file from disk or restore the file if you think it was flagged in error. While a file is in Quarantine, it is unable to negatively impact your Mac, so while the file isn't deleted immediately, it is put in a place where it can do no harm. iAntiVirus also keeps track of its own activities, from downloading updates to quarantining files. You can access this history by clicking the History tab in the iAntiVirus preferences. You can sort the logs by date or alphabetically by detailed description, so you'll never to guess what iAntiVirus is up to. When it comes right down to it, any antivirus program is only as good as its definitions. If those definitions are out of date, then the antivirus program has no idea how to identify malicious files. iAntiVirus has a feature called Smart Update that is used to keep both the application itself and its definitions database up to date. Given that iAntiVirus only keeps track of Mac-specific malware, the database is very small, though the company assures me that it takes, at most, two days to get a new threat signature into the database. At the moment the database has 102 entries; of these is a test virus, and several others are proofs of concept--viruses that people created because they can--that haven't actually been seen in the wild. Scheduling scans and updates is simple, but you don’t get much flexibility. iAntiVirus’s most attractive feature is the price: it is free for personal use, though businesses will have to pony up $30 for a license, which gets you 24/7 support, including phone support. The interface and speed both exceed that of ClamXav ( ), making it a compelling alternative to that open source product (though ClamXav protects against both Mac and Windows malware). PC Tools iAntiVirus 1.0 has clearly defined limitations. If you're more concerned about Mac-specific threats on your personal Mac than with passing along Windows viruses to your friends, iAntiVirus is worth installing. It is free (for personal use), scans many files quickly, and isn't resource intensive. I can't imagine many scenarios where a business would be better off buying a commercial license of iAntiVirus over a more feature rich, though slightly costlier, antivirus solutions like Norton AntiVirus 11 ( ). Businesses are more likely to either employ both Windows and Mac systems or interact with Windows on a day-to-day basis. In that sort of environment, iAntiVirus's sole focus on the small amount of Mac malware is a big deterrent.